Professional Camera Drones Can Fly Indoors! When Walmart Canada was in the process of creating an internal corporate video to showcase their new signage and store layout they called on DroneBoy. Our task was to fly one of their stores with the new test layout and capture the video content that would be turned into an internal video for their staff and management teams. The idea was to show head office just how open, roomy and un cluttered the new store design really was. I must say, we were a little hesitant at the idea of flying indoors at first but decided it would be a good learning experience and worth a try with the right safety measures in place. The team went to the store after hours when the store was empty and flew over the isles, past the signs and just about everywhere we could get a drone. It was a great experience and a real eye opener as to what is possible indoors at the right venue. The results were amazing and the client loved the final product. Recently our team was asked to apply our expertise on an indoor studio shoot where the subject was two new model 2017 Nissan vehicles. Car manufacturers are constantly creating new models and with each new iteration a whole bunch of promotional materials need to be created (lucky for us). These include stills, video, 360 content and more. The car companies and the advertising agencies alike are always on the lookout for a new way to present their shiny products and this time drone video was thrown into the mix. Filming cars indoors in an art form and the folks who do it are true masters of their trade. In Toronto Terry Collier has made a real name for himself in this niche market having filmed hundreds of vehicles over the years. Terry has a custom-built studio with a turntable big enough to rotate a car, lots of high end lighting, a technodolly and cameras galore all set for the task of making vehicles look their very best. 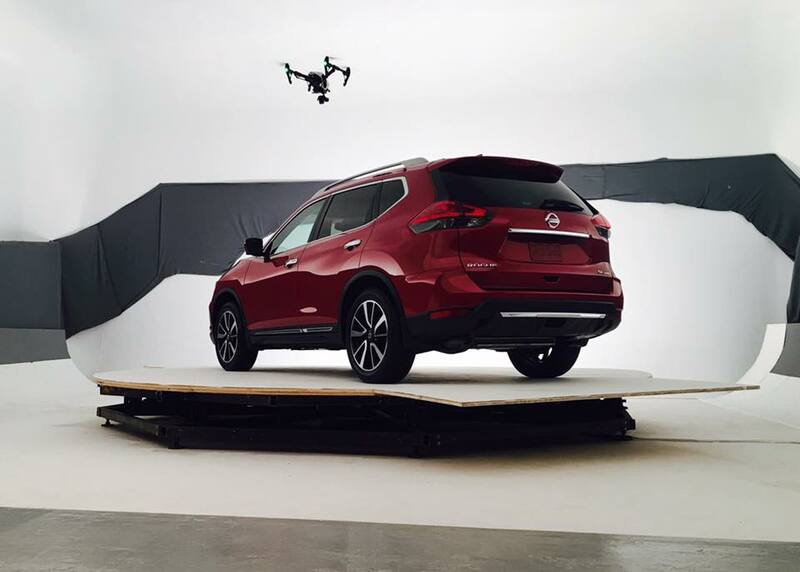 And for this Nissan shoot he had a new secret weapon – he had a drone! The shoot went great and everyone was surprised at the unique perspective that we could get with the drone quickly. The drone video had a very different feel to the footage coming from the Technodolly shots. Ours had more of an “over the shoulder” dynamic look and feel. The Agency was impressed! Obviously, with both these examples, a controlled, safe and secure environment is key. Safety briefings and protocols need to be modified for the indoor environment and piloting skills need to be that much more precise. Remember, GPS guidance will not work indoors so your drone will be less stable in an environment where you have less room. Yikes! Everything needs to be cleared away and the space must be made as open as possible. Objects need to be secured, particularly lighting and any light weight scrim materials or else things will come crashing down quickly. Dust can be a real issue too so indoor venues need to be as clean as possible prior to launching. In very small spaces (<30’ square) prop guards are a good idea. Also, take advantage of the new technology out there. We love the new optical sensors that are found on the new models like the DJI Inspire2 and Phantom 4PRO. These amazing technologies will usually stop the drone from colliding with objects once calibrated properly. 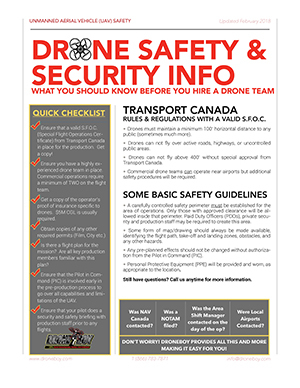 Yes, indoor flying is challenging but the results can far outweigh the trouble if you go in with a good plan, you make the proper preparations, have the skills and a solid team. Good luck!